Hey guys! I haven’t done an OMM since before BEA. But last weekend, ABC Family had a Harry Potter movie marathon – with all eight movies! They’ve never done this before. 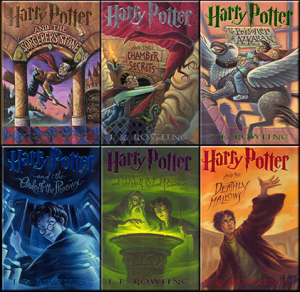 Now, every time I watch a Harry Potter movie, it gets me in a Harry Potter mood and I end up desperate to re-read the series – something I haven’t done since 2009! This need to re-read all seven HP books got me thinking. Though I’m a huge Potterhead, I don’t really talk about HP a lot unless someone brings it up on Twitter or I’m watching the movies. But I don’t think I’ve ever really mentioned HP on my blog, except maybe in passing. So, today I’m going to share with you some of my biggest Harry Potter Confessions – things that, though I’ve thought about a lot, I’ve never voiced out loud to anyone, as far as I know. Some of these confessions have to do with the books only, some with the movies only. The rest are general observations. And, obviously, this contains Harry Potter spoilers! So if you, for whatever crazy reason, have not read the books or seen the movies, STOP NOW! You have been warned. So, without further adieu – and in NO particular order – enjoy! 1 – I didn’t like Harry Potter when it first came out. Seriously. I know it’s hard to believe, but I just didn’t. When I was younger, I hated things that were over-hyped. If a ton of people loved something and went crazy over it, I scoffed at it (Harry Potter, the fact that almost every 90’s girl had a crush on Brad Pitt, etc). So it wasn’t until 6th grade when my teacher decided to read the books (only the first four had been released at that point) to our class during snack time that I really started to get into them. At first, I would sit at my own desk, reading whatever book I had brought with me that day. But over time, I started listening to my teacher reading more and more. Before I knew it, I was hooked. In the end, I was the first person over to the reading carpet each day, eagerly awaiting the start of snack time. I even bought my own copies of the books and read along with – and sometimes ahead of – the teacher. So really, I have my 6th grade teacher to thank for my being a Potterhead now! 2- I pronounced most of the names wrong until I saw the movies (or until someone corrected me!). Hermione’s name, specifically, but a bunch of others, as well. 3 – The Half-Blood Prince book AND movie are my least favorite. And no, it’s not because of Dumbledore. As interesting as it was to finally learn more about Voldemort’s background and his life as Tom Riddle, I just found some of those passages to be incredibly boring. And Slughorn wasn’t one of my favorite teachers, either. Plus, Ron playing Quidditch was just kinda odd to me. In the movie, Lavender Brown was especially annoying. Not to mention that Daniel Radcliffe was reportedly drunk or hung over for the majority of filming and it shows in his acting. It’s supposed to be a very dark movie and it’s almost comical. 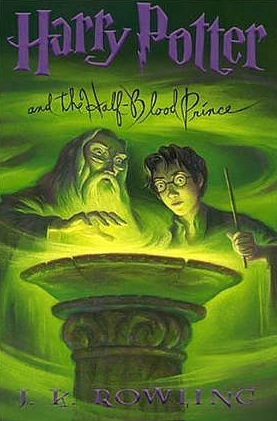 Of all the books in the series, I think I’ve read the Half-Blood Prince the least! 4 – Dumbledore’s death was tragic. Snape’s was crazy. And Fred’s was just down-right cruel. But the deaths that upset me the most were Sirius and Lupin. Harry needed a father-figure in his life and both Lupin and Sirius were like fathers to Harry. They were adults that he could go to for help, people he could trust. And they both died. To this day, I still question what REALLY happened to Sirius. Especially the way it’s shown in the movie version of Order of the Phoenix. It just seems so odd and abrupt. 5 – I love the beginning of The Prisoner of Azkaban. It’s so awesome seeing Harry finally stand up to the Dursley’s. I love seeing him on his own in the Leaky Cauldron and Diagon Alley. It’s one of my favorite parts in any Harry Potter book! But the ending (With Harry and Hermione going back in time) gets so repetitive and boring! Honestly, I’ve read it so many times that at this point, I just skip the going back in time part and read ahead to the the actual ending. (Though, if I were to do a re-read right now, I’d read each book cover to cover since it’s been so long since I’ve done a re-read!). 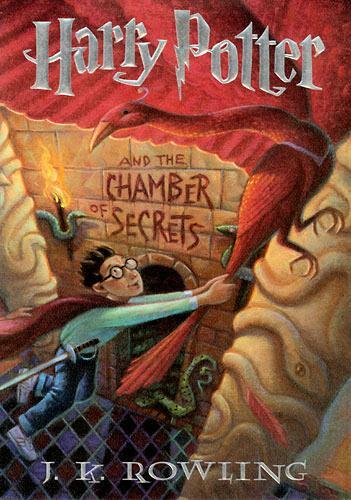 7 – I’ve read Sorcerer’s Stone and Chamber of Secrets so many times, I lost count around 36 – and no, I’m not exaggerating. I actually had to buy new hardcover copies because the spines broke from being read so many times. 8 – My last re-read was Summer 2009. So you know I’m due for re-read very, very soon. Just need to find the time! 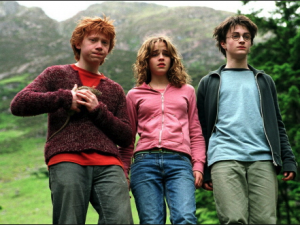 10 – I HATED how the Prisoner of Azkaban movie took them out of their Hogwarts uniforms/robes. It’s one of my biggest issues with the movies. At Hogwarts (and in the books), they’re ALWAYS supposed to be in their uniforms and robes. It bugs me so much, I didn’t enjoy the third movie as much. I know, that’s a bit much, huh? But it seriously annoyed me! 11 – I never went to any of the midnight showings of the movies (I hate crowded movie theaters and usually wait at least a week to see something in the theater), though I went to midnight book release parties for books 5-7. 12 – So many people are going to hate me for this one… But I did NOT like Harry and Ginny together. I mean, your best friend’s sister? It was just too awkward, especialy after Ginny’s obsession/idolization of Harry in the Sorcerer’s Stone and Chamber of Secrets. it was just… weird! Now I’m not saying I wanted him to end up with Hermione, because I didn’t. Honestly, I have no clue who I would have wanted him to end up with. I just know I don’t like him with Ginny – in the books OR the movies. 13 – Richard Harris WAS Dumbledore. He embodied the Dumbledore from the books. Michael Gambon was NOT Dumbledore at all. He was mean and harsh and he yelled too much. I despised him. Okay! I’m sure I forgot a number of things. Re-reading the books and re-watching the movies will probably make me realize that I’ve forgotten at least five more confessions! But for now, there you have it! Thirteen Harry Potter Confessions that I don’t think I’ve ever shared with anyone before. So, tell me: What are YOUR Harry Potter Confessions? What did you like and dislike about the books and/or movies? Do you agree or disagree with any of my confessions! Tell me in the comments below! Aw, man! I missed the movie marathon. Now I’m in a grumpy mood. ;)It was fun reading your confessions. I didn’t get into the hype either, despite having read the first two and liking them(and watching the first several movies). It wasn’t until a couple of years ago that I picked them up and read them all. A girl from my work is actually rereading them right now. Its made me think about doing it too! Awwww! ABC Family always does HP marathons, so you’ll catch it next time! :) I’m always up for a re-read! Hope you find the time to do one! Ahh this was so cool Mer! I really want to re-read the Harry Potter books too! Ever since they came out with the new Harry Potter cover editions, it’s been nagging at me to read them. Ooohhhh, not much further out than me! I started when book 4 was out! I’m glad I’m not alone in the Ginny thing! I don’t have time to really get into a lengthy comment (which I’m so prone to, especially about HP) ’cause I have work to do on a dummy book for submission, BUT, I’ll say just a couple of things, also being quite the Potterhead, though you rival a friend of mine with how many times you’ve read the series! For me, it’s a 3+ and I’ll probably be a VERY old lady before I tackle them again, regardless of how I get cravings now and then! I really enjoyed the movies until “Phoenix.” Any changes they made in the adaptations didn’t truly change the story, but in Phoenix they started changing things that were ridiculous/unforgivable, in my opinion. It tarnished my love for the movies, plus the eventual inclusion of sexual innuendos and images that weren’t present in the books. I agree about Richard Harris, for sure, and I think most people would agree. There were reasons for all the deaths, and although all of them affected me, I sobbed the most over Dobby. PLEASE don’t get a tattoo—phoenix or otherwise—and lastly—SO happy for you having such a wonderful 6th-grade teacher! Think of what you would’ve missed! So glad you loved the post!!! :) I agree that, by the time Phoenix became a movie, things went downhill :\ Dobby was a sad one, too! Oh, and Hedwig!! :( I know, right? I owe a lot to my 6th grade teacher! 10 – Omg Meredith I’m with you on this one. The fact that they were in muggle clothes the entirity of the movie ruined it for me. Like. NO. Especially pureblood wizards like Draco would NOT BE WEARING MUGGLE CLOTHING. They would be in wizard robes if/when not in their school robes. 11 – I didn’t go to a midnight showing until HBP. Before that I had been going with my younger brother, he’s 11 years younger, so he was too young to go. We lived an hr away from the nearest theater and then he had to be up for class the next morning, his mom wouldn’t let him miss. 12 – I don’t like Harry/Ginny as a couple either. She was obsessed with him as a child and it’s just weird. Plus it’s kind of creepy how much like Lily JK made her. For a long time I wanted him to end up with a Slytherin (mind you they’d be grown, realized how wrong they were and changed their views) or I wanted him with Susan Bones. 13 – I wanted Ian McKellen to replace Richard Harris at Dumbledore. I believe he was asked to do it, or just asked if he was in an interview, and he said no, because he had just finished the LOTR trilogy and was still doing X-Men, and did not want to commit to another series. He would have been such a great Dumbledore though. 10-Right?!?!? It bugged me so much!! And you make a good point with Draco, especially!! 12- Right!?? It was sooooo creepy! 13- Hmmm… Interesting. I can kind of see that! Hell YES to 13!! I loved HP from the minute I picked up the first book. I did pronounce names wrong too though. As for picking a favourite book/movie, I really can’t – some of the things that were left out bug me (Peeves) but generally I think they were well done. I’d no idea Daniel R was supposedly drunk or hungover during the filming of the last movie.